A cooler project, I can not imagine! I will be following your progress! Good Luck!! I really appreciate that mklrobo! I saw your profile picture on several posts of the forum and figured you'd see my post and saw the irony that someone with a Data from Star Trek avatar will see my project that is partially inspired by Data! not an overnight thing. You really have to love robotics, but also, robotic concepts in overall context. out of your efforts; That alone, is well worth it. wanted a personal assistant robot, or related project, could have one, following instructions on the post. in my own skills/career; so, I can justify the effort/money I put into it. movie/serial potential. See you around the Forum! incredible batteries like this, please tell me. items you need. All government buildings (and some houses) are already wheelchair accessible. In reference to your mechanical structure, I have found the following, thus far. types of materials used, and work ergonomics fall into the design. The next advancement is a modification to the hero structure, a Super-Hero ! This phase would have arms, legs, wheels, built on the functions of the previous model. everybody is familiar with, and building upon that, to be an open source robot. sub - processor will be needed. This is why working together, like the Linux community, is important. A lot to think about, when building a robotic superstructure, don't you agree? "as long as your construction info is available everyone can use something"
I agree! I'm planning to go to great lengths to record all of my methods to share with others in an open source way. "The only bad thing about the standalone robots, are the batteries!" My plan is to have the robot run off of a power cable from wall outlets and when he needs to switch rooms he unplugs himself, staps on a backpack loaded with batteries, plugs that in, unplugs his power cable, walks to the next room, plugs his power cable back in and sets his battery backpack onto the ground till he needs it again to change rooms again. So the batteries will be designed to not be built inside of him. I got this idea from Asimo. "I would recommend using a wheelchair for your robot to begin with." Awesome idea! Never considered that and I can see alot of advantages. I'm so glad you are here giving me guidance! I've planned the brains/software alot as well. I'm going to have a laptop or powerful tablet or two in the chest of the robot running the main logic engines and am going to interface those with arduinos for lower level functionality and from the arduinos to servomotor controllers of course and from those into the servos. Plus I'm going to have mostly likely over 100 sensors. in the misc section in this forum, Analyzing the Axon: Coding, Construction, and Contraptions. OK! I found the Pen car starter! The size of a small handheld radio, brand name, Powerplus. It is a 13600 MaH battery! It says it has a 500 Ampere peak current output! legs, arms, or anywhere you can to squeeze out all the available power per area you can get. computing the square footage of a house, to obtain the maximum living space, as cost per foot. Thanks for finding that battery suggestion! I'm aiming to just run off a wall power outlet for many years to come and not worry about batteries. I'm not going to design room for batteries inside the robot body as I already have a huge amount of space need for all the servos and sensors and wires and stuff. Therefore, I'm going to put batteries into a backpack like Asimo does. I won't even worry about that for many years well after the robot is finished will I worry about batteries in his backpack to make him mobile beyond where his power cord will reach. I have been working on the battery problem, for some time, and finally found the solution! I think I have stumbled onto a generalized power ratio solution, to use for all robots. 1 hour for work. Any number greater than 1 is good, and could be considered more efficient! goal, insofaras efficiency. This may be able to be applied, just looking at a robot! There may be mechanical cheats, however, like wheels, which may prove more efficient for work. I will play with this concept, and see if it pans out. Wish me luck! 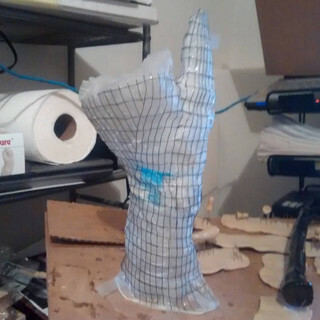 Here are some recent cool progress shots of the hand coming together! Although I am all for your project, I don't see how you can make all this happen with servos and pulleys. The robots you see that have any real strength are powered from a common power source and are run by hydraulic actuators which have the advantage of being linear motors. That is an enormous expense. So, let's digress. Muscles work by contraction, hydraulics don't. You will need hundreds of actuators and they will need to be small and relatively inexpensive. Let me propose a very old method of mechanical energy controlling various devices, the same method used in player pianos and those circus orchestras with all the doo dads. They work on a vacuum. Pistons would not need to be metal, they could be neoprene tubes that collapse. There are various possibilities. And some leakage would not be fatal. At least that is what I have come up with for an "art/music" project I have waiting in the wings. That reminded me of some metal cords, called Nitrinol. These metal "strings" shrink when electricity is applied. Each thickness has a certain amperage draw, and pull of torque accordingly. Haven't got the hang of this forum yet. I think both of those suggestions have HUGE merit and are very exciting possibilities. I thank you both for bringing them up! This vacuum neoprene idea and the Nitrinol wire idea have my attention. Maybe one of them can be a plan b? I'm already all in with my existing servomotor and pulley system plan having already bought a lot of what I need, already tested and done proof of concept, etc. If you brought this up a year ago I might try it, however, I have to at least give the way I have been planning for over a year a try before trying anything else ya know? I don't see why the way I am planning wont work. Also, I agree it will be WEAK. I can upgrade to more powerful higher voltage motors later though if I get more $. If you have proof of concept then you should run with it. The muscle wire is expensive and I think may be too slow and energy inefficient. The vacuum idea would require building things that are not off the shelf that have never been done. The advantage that air, or vacuum has is that it has energy storage, you can get a huge jolt of power and then wait for recovery. In my mind this is similar to the way most people use muscles. I have given some thought to your idea of bands and servos, not that I wish to copy your project, but rather use it for a flexible spine. The bands would run through the spine and then outside where they would be tugged on by servos. Assuming the spine returns to a straight position, the curve of the spine with one servo could be modeled on a quadratic bezier. I would need 3 servos. Since you have no flesh your robot could be relatively light, reducing forces needed. I think you may need to compromise between speed and servo size or by setting your pulleys as a force multiplier, probably you have already done that. What are you casting with? How is the weight? I'm making my simple little toy out of cypress and find the skeleton weighs a small fraction of the total. I suspect you may have substantial weight. Good luck to you and we await to see your progress! @cyberjeff Thanks for the feedback and thoughts I enjoyed the read! I too will have a flexible spine modeled after the human spine. Also, I WILL have realistic silicone skin. The bones are being made via clay sculpt and then a cast pulled from that made of composite material construction. The total weight of the bones will be in the 2-3lb range I believe they are extremely lightweight and hollow. 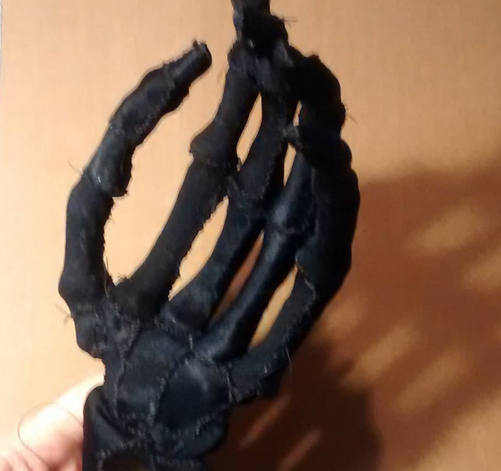 I show in depth how I'm making the bones on my youtube: https://www.youtube.com/c/artbyrobot1 I hope you enjoy the project as it unfolds! @cyberjeff Thanks for the feedback and thoughts I enjoyed the read! I too will have a flexible spine modeled after the human spine. Also, I WILL have realistic silicone skin. The bones are being made via clay sculpt and then a cast pulled from that made of composite material construction. The total weight of the bones will be in the 2-3lb range I believe they are extremely lightweight and hollow. I show in depth how I'm making the bones on my youtube: https://www.youtube.com/c/artbyrobot1. I hope you enjoy the project as it unfolds! Sorry, link comes up 404. 3 lbs is pretty good. What fascinated me was how he got the motion right. I don't understand why, if you are covering all this up with skin, why the bones have to be so true to form. It seems to me that the details are pushing the complexity and time frame way up. I think for the amount of micro detail and control you need those may be useful to you as they take up little room. For my purposes, it could pull a spine into a curve. I'm saving that for later, i just got a bunch of servos and the Arduino Due so it is time for me to see if any of my ideas work! 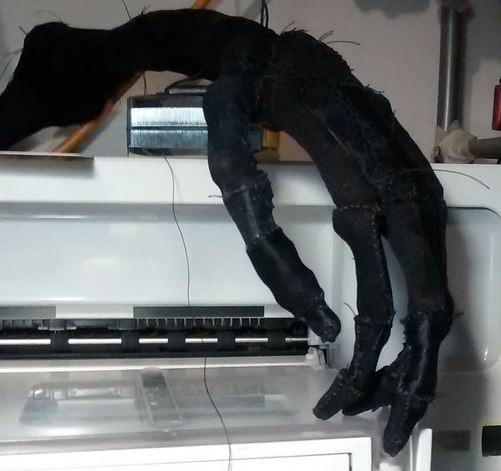 @cyberjeff - the realistic bones are done because the body's bone shapes have a distinct purpose. They are designed amazingly for strength reasons and are superior to hinge joints. They are curved in all directions and as we all know, a curve is the strongest shape in nature. This makes them strong despite their light weight. The design of the joints of the bones is amazing and powerful as well. I'm staying as true to human body design as I can because the human body design is amazing and excellent. As far as latex vs silicone, the verdict is silicone is superior in durability and quality. It also has translucency like real skin. About the twisted string muscles, I'm feeling there are some issues and complications with that such as control, feedback, the lack of documentation and support tutorials and articles, etc etc. Servos are tried and true so they are my preference. My knowledge of physiology is weak. The muscle structure of the human body is complex, it seems to me that there are for some joints so many degrees of motion possible and that some compromises will of necessity have to be made. With that said, you seem to be moving along and more power to you. As far as servos, my little project which has limited degrees of motion is up to 12 servos for the arms and legs, yours is considerably more involved. I await to see how all those servos will fit in! 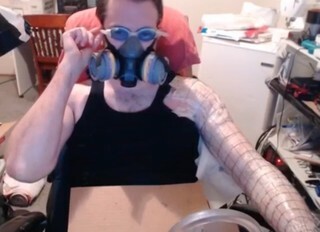 Exoskeleton mesh building on arm! 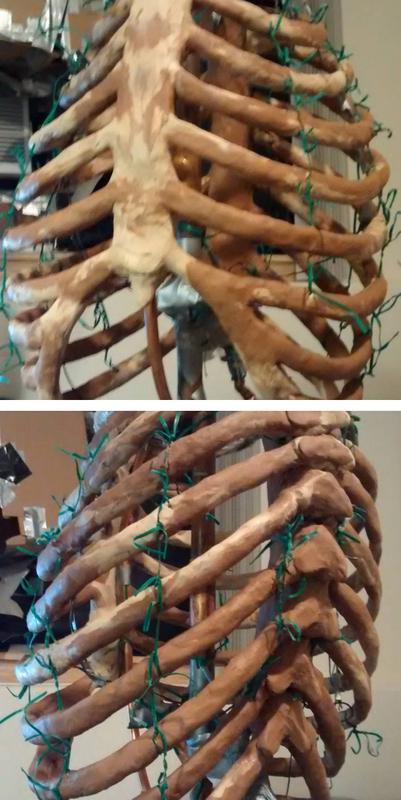 Here's the clay sculpt of the rib cage for the robot. Here is my latest progress on the bot. It is a mesh capture of my face and neck to be used to aid in sculpting the robot's skull and defining the mass of its neck. I'm building it, in a cave from a box of scrap. Hey artyrobot1! Just came across your project and thought it is very cool! How is shaping up in 2018?